Mike O’Mary tells stories from real life that blend humor and poignancy in the tradition of Robert Fulghum, Dave Barry, Bill Bryson and other great American humorists. “It all started with a story called ‘Wise Men,’” says Mike. “It was a story from my childhood about a poor kid from my old neighborhood and the lesson I learned when we were both cast as wise men in the school play.” That story was published in newspapers across the nation and broadcast on National Public Radio, and so began a tradition of holiday essays from Mike O’Mary. The essays in this collection were read by Mike as part of “Morning Edition” on Northern Illinois Public Radio, and published in the Sunday magazines of the Chicago Tribune, Denver Post, Rocky Mountain News, Baltimore Sun, Cleveland Plain Dealer, Detroit Free Press and elsewhere. 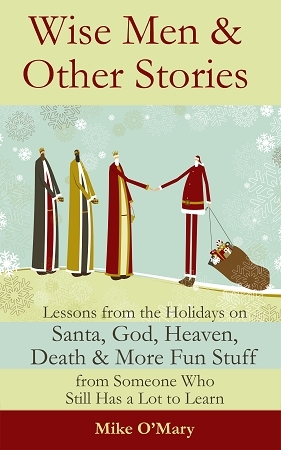 Along the way, O’Mary developed a cult following for his holiday stories. "O'Mary has a gift for simple, frank exposition of life's most poignant moments," says author Stephen Parrish (The Tavernier Stones). In Wise Men and Other Stories, O'Mary shares that gift with all of us. Enjoy this priceless collection of humorous and thoughtful stories this holiday season -- and for many holidays to come.